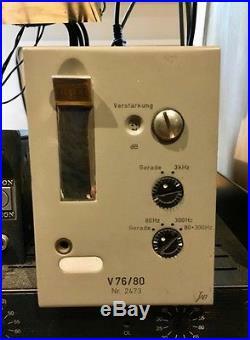 Telefunken V76/80 tube preamp module for sale. Comes with XLR in/out and 230V power pigtail. Plug and play, no rack needed. I have owned the unit for close to 20 years, I traded a few of them from John LaGrou of Milennia Media in the mid 90's, and this is the last one that I've hung on to. I had it recapped by Dan Zellner in NYC a couple of years ago and the unit has been in storage since then. Works as it should, no issues apart from the light bulb behind the db indicator which doesn't come on. The item "Telefunken V76/80 vintage mic preamp" is in sale since Monday, August 21, 2017. This item is in the category "Musical Instruments & Gear\Pro Audio Equipment\Vintage Pro Audio Equipment". The seller is "fine-acoustic-guitars" and is located in Oslo. This item can be shipped worldwide.